Wednesday, we’re going to look at some wonderful examples of weeping when other weep and talk about how we can rejoice when others rejoice. Don’t you love how the left side of this photo has a blooming flower, rejoicing as it looks on to the single tear drop about to fall? Maybe it’s part of another sunflower that hasn’t quite bloomed. Or maybe it’s the same flower. We rejoice. We weep. We’ll unpack this verse in further detail in the context of humility. I hope you’ll join me as we move on through Romans 12:9-21. I’m keeping it short so you can pause before hopping to you next blog, and take a minute to let the Son shine on you. I hope today is one of blooming, but if it’s not, if it’s one of weeping, I’m praying for you. If you’d like to share your request, please email me. If you’re a busy mom, especially, this song is for you and it’s a key factor in what we’ll talk about on Wednesday. 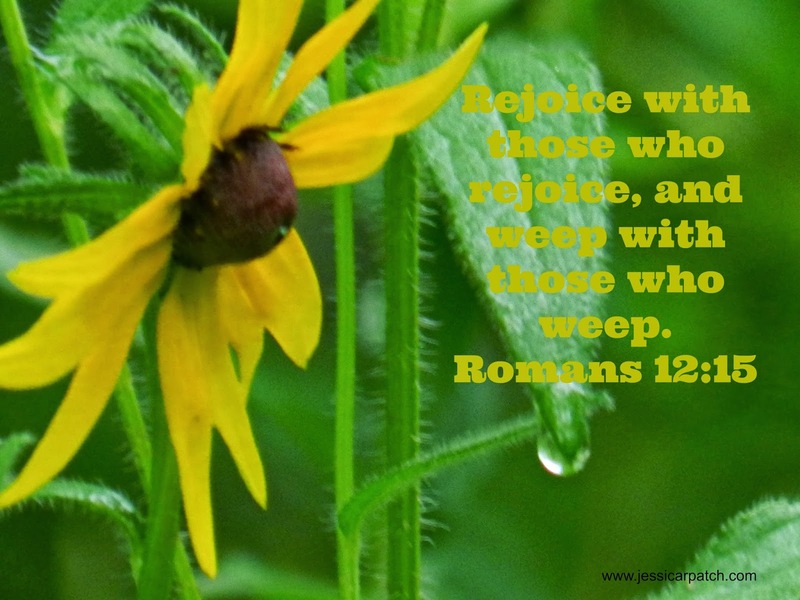 What do you think is easier: Rejoicing or weeping with others? Why?